Vanilla is said to be the world's most popular flavour. As much as 40 per cent of the world's ice cream is vanilla flavoured. Its sweet, mildly fruity, spicy and alluring aroma is considered to be both sensual and calming. Aroma analysts call vanilla the smell of love. Others describe vanilla as good business because it sells millions of dollars worth of cakes, perfumes, cosmetics and many other things nice. Vanilla is driving farmers of Kerala mad as well. But not with ecstasy. They are worried because this is the time they harvest pods of vanilla beans on their farms. But this is also the time when they do not get the price for their labour. The problem, they say, is that the ice cream we eat as vanilla is not vanilla, it is synthetic vanillin extracted from effluent waste of paper mills or even coal tar. But this synthetic product has taken over the vanilla industry. The farmers blame the government for promoting vanilla plantation but not securing the use of their plant in food. Industry says the synthetic fake is good enough. It is also cheap. Why then should they go for the original bean? In all this, prices have crashed. Vanilla farmers are close to bankruptcy. arnab pratim dutta travels to the farms of Kerala to find exactly what is rotten in the business of this sweet smelling spice. Vanilla is said to be the world's most popular flavour. Its sweet, mildly fruity, spicy and alluring aroma is considered to be both sensual and calming. Aroma analysts call vanilla the smell of love... ARNAB PRATIM DUTTA travels to the farms of Kerala to find out what is rotten in the business of this sweet smelling spice. Is our ice cream natural or synthetic? Jacob Sebastian no longer wants to invest in his vanilla plantation. He still has more than 1,000 vanilla plants intercropped in his half hectare (ha) rubber plantation in Kerala's Kottayam district. But this year he did not hand-pollinate these plants so he does not expect a crop. In a nearby plantation, P J Joseph uprooted 1,250 plants that grew on one-third of his 1.2 ha farm. Joseph is now planning to grow only rubber in this area. In adjoining Eranakulam district, Ibrahim, a small-time farmer, has removed all his vanilla plants from 0.8 ha of his coconut plantation. The story repeats in other parts of Kerala as well. Farmers say the business of vanilla has let them down. The crop is highly labour-intensive and takes time to flower, the seed takes even longer to cure. It's literally a labour of love. Vanilla does not self pollinate. In nature, vanilla is only pollinated by the Mexican bee and humming birds.But these are found only in Mexico and all attempts to make them work in other regions have failed. Farmers have to 'manually' pollinate the flower. But the flower of vanilla lasts about one day, sometimes even less, so farmers have to check every day for flowers they can pollinate. Then they use a sliver of bamboo, or a pin or needle or even a toothpick to separate the anther and the stigma and press the anther on the stigma. The flower then pollinates. The bean is born. This green bean does not have any flavour. It now has to be cured--a time-consuming process taking up to six months. Meticulous management is required to ensure that the flavour is enhanced, without any spoilage. 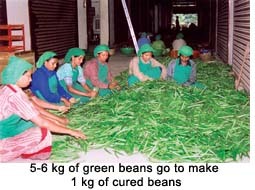 About five to six kg of green beans when processed, give a kg of cured beans. The cured beans can be exported and last for many years. The final stage is the one in which the vanilla is extracted from the beans. This is a process that has been tightly controlled globally and demands high price. This is when vanilla, the spice of life, is finally ready to use. But even then, the quality is a matter of science and choice. Vanilla is assessed on the basis of its principal flavour and aroma compound--vanillin. All this, in turn, is influenced by where the bean is grown, how it is grown and cured. Vanilla from Madagascar, the Comores and Reunion islands is called the Bourbon type, which sets the industry's standard for high-end beans. Indonesia, which harvests its beans early, has captured the low quality bean market. But analysts say Indonesian beans are fast catching up in their flavour and quality. Madagascar is the leader in vanilla, controlling over half the world's market. India made a relatively late entry into world trade but its stock is rising. In 2006-07, India produced 230 tonnes of cured beans, more than 10 per cent of the world production of over 2,000 tonnes of cured beans. This was up from 188 tonnes of cured beans produced in the previous year. This is partly because the crop, which needs three years to mature, is ready for harvest. 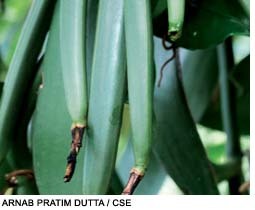 Kerala leads the production of vanilla beans in India with a share of more than 52 per cent. Last year, Kerala alone produced 122 tonnes of cured beans or close to 660 tonnes of green beans, followed by Karnataka with 88 tonnes and Tamil Nadu with 22 tonnes of cured beans. Vanilla is not new to India or Kerala. In fact, the English East India Company tried to introduce this orchid in 1830 but the plant died soon after it flowered. The British, competing with the French colonies of Madagascar, then experimented in other states--Assam, Bihar, Tamil Nadu and West Bengal. But all attempts failed. In the 1990s, when the spices board tried to persuade farmers to take up vanilla cultivation, there were hardly any takers. The reason was that till 1996, the trade and the price of vanilla was tightly controlled through a cartel (known as Univanille) based in Madagascar and so the price remained low and volatile. By then the market was already segmented. The high-end market was under the sway of Madagascar and Comores, which in the best of times earned between us $60 to us $75 per kg of cured bean. The low quality market was catered to by Indonesian beans, priced between us $20 and us $30 per kg. Other countries, like Uganda, that were not part of any of the groups, earned between us $50 to us $60 per kg of cured beans. Actually, vanilla prices have never been stable. Market observers talk of the total opacity that characterises the international trade in vanilla. In the 1990s, for instance, Madagascar dictated terms because it had huge stocks of beans. As the demand was more or less fixed, any influx of beans meant a decrease in selling price in 1997, export prices for 'low quality' Indonesian vanilla went down to as low as us $10 per kg and even bourbon vanilla was selling at a little more than us $15 per kg. But things changed in 2000. That year, Madagascar was hit by the cyclone Hudah and a severe drought struck Indonesia. Vanilla prices sky-rocketed. By 2002, one kg of cured beans was trading at us $87 and by 2004, the prices of the beans had jumped to us $400. Price of green beans was also up to more than us $50, even though Madagascar stabilised its production by 2004. This high in prices set off a gold rush in India. In 2002, farmers began with incomes of Rs 1,250 for a kg of green beans (against the Rs 50 they are being offered in 2007); by 2003 prices had peaked to Rs 3,500 per kg. P R Muralidharan, treasurer of the Indian Vanilla Growers Association, recalls this heady period "The news of the failure of Madagascar's crop had spread like wildfire. Farmers saw prices going up. Anticipating even higher returns, they took up vanilla cultivation." The bean was so valuable that farmers hired watchmen, posted guard dogs and even put up electrified fences to guard against thieves. P J Joseph of Kottayam, who made a killing from his one acre vanilla plantation, says he hired guards because, "there were thieves all around who would pluck even the unripe beans. There was no other way to protect this crop which became as expensive as gold". But the gold rush did not last long. Madagascar and Indonesia revived beans from these countries were back in business. Prices crashed like never before. One reason, market observers say, is because the high prices of 2000-2004 scared users of vanilla into switching to the artificial alternative. It was lot cheaper compared to the natural variety and, quite significantly, a lot more stable in terms of price. Vanilla users were loathe to take any chances with a cured bean whose price touched us $400 per kg. Most Indian vanilla farmers are today told they can sell their produce at Rs 50 per kg. The area under vanilla has gone down from 5,800 ha in the three vanilla-growing states--Kerala, Karnataka and Tamil Nadu--in 2005 to 5,100 ha in 2006. "Those who took up vanilla farming after 2001 were the worst hit. Expecting high prices in the coming years, many took huge loans to plant vanilla while some borrowed money to secure their farms against thieves," said Muralidharan. "Since vanilla takes three years before it starts to fruit, these farmers could not cash in into the boom and were left with surplus stocks with no takers," he adds. Farmers in Kerala are a bitter lot. Much of their ire is targeted at the Spices Board of India, headquartered in Cochin, which they say has let them down. Sebastian, who is also a member of Organic Spice Growers Federation, says "The spices board was busy promoting vanilla as the wonder crop that would make you rich overnight but did nothing to ensure farmers make sustained incomes." Officials of the board, in turn, say that they had warned the farmers of the unusual high prices, but they took no heed. V S Kurian, chairperson of the board, told Down To Earth that he believed vanilla was a profitable crop for farmers even at current prices, because it was cultivated mostly as an inter-crop. However, Kurian's information about the price of vanilla did not match the reality of the current depressed market. He said that the beans were selling at Rs 90 per kg, which was a break-even price. Farmers refute Kurian's contentions. Studies like the one by M S Madan of Indian Institute of Spice Research in Calicut show that vanilla farmers will incur a cost of at least Rs 340 (roughly us $8) to produce one kg of green beans. Other studies show that the cultivators will break even at around Rs 250 per kg of green beans. The price of vanilla in the international market has now stabilised at us $50-us $70 per kg of cured beans and us $5-7 per kg of green beans, in the higher-end quality market. But exporters who control the trade from India say that they cannot sell at this price. They ascribe their reluctance to the opaque nature of the vanilla market. Paul Jose, managing director of Vanilco, a cooperative which purchases vanilla beans from over 25,000 farmers in the region, blames the government for the state of affairs. He points out that while marketing vanilla to Indian farmers, the government had talked of developing the domestic vanilla market by introducing compulsory labelling in ice-creams and other products. It had talked of promoting the use of natural vanilla in the country itself and provide markets for farmers. Vanilco, he says, has reminded Union government officials of these commitments, but to little avail. At a meeting with vanilla farmers in 2005, Union minister for commerce Kamal Nath had promised help. But not much has happened since then. In 2006, the Union minister of state for commerce, Jairam Ramesh, had given assurance that the commerce ministry would make it mandatory for all ice creams labelled and sold as "Vanilla Ice Cream," to contain a minimum of 1 per cent natural vanilla in it. "A year has passed, and it is still a mystery why even a meeting that was scheduled has not taken place," Jose says. What we know as vanilla, the queen of spice, is not vanilla. It smells like it (somewhat). It can even look like it. But it is not the real thing, which has aromatic compounds that touch your senses. Instead, what we have in our food, in our beverages, in our cosmetics and fragrances, is a synthetic extract, which has copied the smell of vanilla and captured it in a bottle. In 1922, the Ontario Paper Company in Canada had no way to dispose off huge amounts of sulphite liquor laced with lignin, which was polluting nearby streams. Chemists found that this waste had something that smelled like vanilla and a counterfeit was born. Lignin, which binds together the fibres in wood, is the waste product in the process of paper making. To remove lignin from fibre, paper companies 'boil' wood with caustic soda. This waste, after the wood fibre is removed for paper making, is called black liquor or sulphide liquor. This is the worst effluent of a paper company. The vanilla we love to eat in our food comes from this effluent waste of the paper mill. A method has been devised to extract vanillin from the lignin. In this, sulphite liquor is cooked and lignin is extracted from it. The lignin is then purified to get Lignin Vanillin also known as usp Vanillin. Then there is the petrochemical route. The petrochemical raw material guaiacol is a component of coal tar. Coal tar is chemically processed to replicate natural vanillin. It has a stronger flavour profile than lingin vanillin or natural vanillin. But this ethyl vanillin needs to be used in minute quantities as it might impart a harsh "chemical" character to food. In recent times, chemists have used natural products such as fruits and vegetables to produce vanillin. In fact, Japanese scientists have even extracted vanillin from lignin found in cow dung. 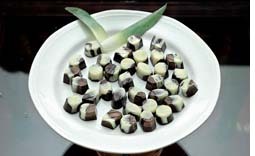 Another non-edible type of vanillin is produced from coumorin extracted from Mexican tonka beans, which has a similar but stronger flavour than vanillin. Due to Coumarin's reported carcinogenic properties, it has been banned by the us Food and Drug Administration (fda). Counterfeit has conquered the world in today's food industry. While the world trade in natural vanilla is at around 2,000 tonnes of cured beans or approximately 50 tonnes vanilla extract, the demand for synthetic vanillin in 2004 was more than 30,000 tonnes a year. The consumption of the synthetic variety is growing at a rate of almost 7.5 per cent per annum with nearly 60 per cent used in the food and beverage industry. 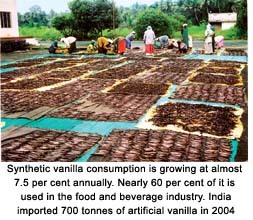 In India, about 700 tonnes of synthetic vanilla was imported in 2004, which was bought by ice cream companies and other users. Companies say they prefer the chemical alternative because it is cheaper. There is no doubt about this. The price ratio between the synthetic and natural product is 110 or even 115. Also, unlike that of the original compound, prices of the artificial variety do not fluctuate, throwing production out of gear. Therefore industries which make a lot of common edible products--from ice cream, biscuits, confectionery to beverages--have switched to the synthetic copy. But they have never told us about the switch-over. The companies in this business are the biggest of the big-- including the agri-giant Monsanto. A key supplier in India is the us multinational, International Flavours and Fragrance, which interestingly is also in the business of exporting vanilla beans. It is for this reason that vanilla farmer groups allege that this company and others are 'dumping' synthetic vanilla in India. They say that consumers are being offered the chemical alternative at throwaway prices--sometimes even free. The problem is that the marketers of vanilla have never really been able to sell us the real compound. Aroma experts say that artificially produced vanillin cannot compete with natural vanilla in taste, even if it makes up in price. Vanillin in its natural state is the main flavouring substance of the vanilla bean. However, along with vanillin there are over 250 different aromatic substances, which give natural vanilla its well-rounded flavour. Unlike a single metallic flavour imparted by the synthetic variety, natural vanilla releases its flavour components slowly, one after the other, giving it a subtle taste. It is this sequence of flavours, which makes vanilla the queen of spices. Vanilla grown in different parts of the world has its distinctive flavour profiles. Madagascar's vanilla, considered commercially the best variety, is very often described as rich, smooth, rummy and full-bodied. The Tahitian variety is known to be sweet, very fragrant and perfume-like while its Mexican counterpart has a sharp, slightly pungent, woody, resinous, sweet and spicy flavour. In 2001, the popular American food magazine Cook's Illustrated, conducted a review of 18 major super market ice cream brands to rate them for their flavour and texture. Of these 18 ice creams, two had artificial vanillin. Only two of the confectioneries--Blue Bunny regular and Blue Bell French--contained imitation vanilla extract. One failed to make it out of the elimination round, and the other landed in next-to-last place in the main tasting. Clearly, natural vanilla is a key component in good ice cream. The tasters of the magazine explained this best. "Some of the best-textured contenders fumbled when it came to flavour. Although the occasional ice cream lost points for too-potent vanilla notes (especially "artificial" or "boozy" flavours), by the end of the tasting it was clear why "vanilla" is often synonymous with "plain". The 2005 Export-Import Bank of India (exim bank) study on vanilla and its potential in India says that labelling laws for ice cream can create a viable domestic market for the essence in the country. 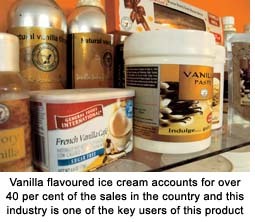 Vanilla flavoured ice cream accounts for over 40 per cent of the sales in the country and this industry is one of the key users of this product. But currently, almost all the vanilla we eat is artificial, not natural. According to the exim bank study, artificial vanilla flavoured ice cream accounts for 35 per cent of all ice cream sales in the organised ice cream sector. This sector was valued at about Rs 500 crore in 2005; it is estimated to grow 15-20 per cent annually. The study also reckoned that 200 tonnes of artificial vanillin was consumed by the food and beverage sector in 2005 with the ice cream industry alone consuming about 130 tonnes.This consumption is expected to increase to 300 tonnes by 2007. In India, ice cream makers include big names like Hindustan Lever, which sells the Kwality Walls brand, Amul, Vadilal and Mother Dairy. There are, in fact, a few international brands in the fray as well. The exim bank study estimates that even if, "A mere 11 per cent of the present synthetic vanillin used in ice cream industry is converted to natural vanillin use, the demand for about 15 tonnes of natural vanillin would be created. This would mean a demand for 750 tonnes of cured vanilla beans, almost eight times the current production of the country." 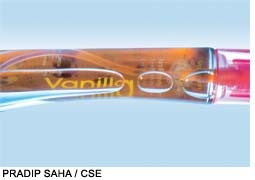 Currently, in India, only Amul has launched its all natural flavour called Vanilla Royale. It is buying small quantities of extract from Vanilco. Mother Dairy, the ice cream brand of the National Dairy Development, is conducting pilot trials of its new all-natural ice cream. The company told Down To Earth that it expects a commercial launch in 2-3 months. Observers say that commercial use of natural vanilla will require either mandatory use of vanilla in the ice cream, or at the very least labelling of the product so that consumers know what they are buying. In all countries, the price of synthetic vanillin is much cheaper than its natural original. But a lot of countries have introduced measures to promote the use of the natural product in high-quality food. In the us, fda has mandated that any confectionery that describes itself as "vanilla ice cream," must be flavoured with natural vanilla extracts. 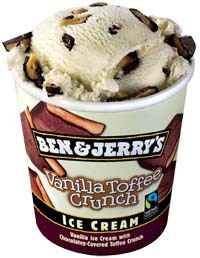 For an ice cream to be called "vanilla flavoured ice cream," a mix of artificial and natural essence has to be used. However, the natural ingredient has to be higher than the artificial substance. Ice creams in which synthetic vanillin dominates the natural variety--or which have only synthetic vanillin--must be called "artificially flavoured vanilla ice cream". For vanilla extract, fda requires a minimum of 13.35 ounces (28.3 grammes) of vanilla beans to a gallon (approximately 3.8 litres) of alcohol-water mixture, which has at least 65 per cent water content. Germany has labelling rules pertaining to vanilla use as well. Here food regulations mandate that labelling must differentiate between natural and artificial vanilla. It also specifies food labels for natural bourbon vanilla. The Prevention of Food Adulteration Act differentiates between natural flavours--obtained exclusively from natural product--natural identical flavouring substances--chemically isolated from aromatic raw materials--and artificial flavouring substances--not in natural products. It also has separate standards for the quality of ice cream. But there is no provision for either mandatory use of natural flavour, vanilla in ice cream or labelling for it. Manufacturers can use natural or chemical vanilla and pass off the product as vanilla. The Bureau of Indian Standards has specifications for ice cream. This standard which was last revised in 1995 makes no distinction between ice cream using natural flavours and ones that use natural identical flavouring substances. It simply says, "vanilla extracts and various artificial or imitation flavours shall be added to the mix after pasteurization." When contacted by Down To Earth, ice-cream industry representatives harped on the difference in price between natural vanilla and synthetic vanillin. They also say that 'stability' of the price is an important consideration. Currently, a litre of synthetic vanillin sells between Rs 250 and Rs 400, as against a litre of vanilla extract, which sells for between Rs 3,500 and Rs 4,000. But the economics is not so straight-forward. Take the example of the Kerala milk cooperative also known as Milma. 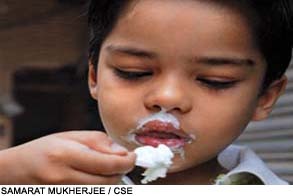 Since January 2006, Milma uses natural vanilla to flavour ice cream, which costs Rs 4,000 a litre. Before this, it procured one litre of synthetic vanillin at Rs 310. But for manufacturing 40 litres of ice cream mix (a gallon), Milma uses 40 ml of natural vanilla. In the case of synthetic vanilla it added 100 ml for the same quantity of ice cream. In other words, it spent Rs 0.70 for one litre, using synthetic flavour and now it spends Rs 4 for the same litre with the natural flavour. But there is another twist to the ice cream tale. To manufacture commercial ice cream, the product is pumped with air to give it the creamy texture and volume. Without air the ice cream would be akin to an ice cube without the creamy texture and would be very hard to scoop. The air component can comprise anywhere between 30 to 60 per cent of its total volume. In the case of Milma the air component is about 44.5 per cent--for every litre of ice cream mix, Milma gets approximately 1.80 litres of ice cream. So for every litre of processed vanilla ice cream, Milma only spends Rs. 2.20 for flavouring it naturally while it used to spend Rs 0.38 with synthetic vanillin. 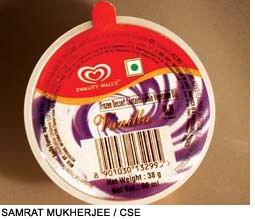 In Milma's case the difference of cost between the natural and artificial ice cream comes to about Rs 1.92 per litre. The exim bank study corroborates this. It notes that "use of natural vanilla concentrates in the Indian ice creams may increase the final price to the consumers by about Rs 0.40 to Re 0.60 for every 200 ml cup of pure vanilla ice cream". Clearly, this cannot be too high a price to pay. The profit margins in ice cream range from 30 per cent to 50 per cent, hence the cost difference between the artificial and natural is not much. The question is if consumers deserve better or not. Labelling or mandatory use of natural vanilla will go a long way to promote this crop. But this step will be incomplete unless accompanied with technologies to cure and then extract the vanilla. The real profits are in the value addition-- turning the green bean into flavoured bean--and then in essence, not in the business of farming the crop. But this business, like the business of the beans, has been a closed industry controlled by a few companies worldwide. In Madagascar farmers grow the beans but it is others--small group of manufacturers--who cure the bean for flavour. It is only in Indonesia that farmers cure the bean and so earn profits from this value addition. The business of extraction is even more tightly controlled. Only a few companies--mostly in the us and France--are in this business. The us has also issued a standard of identity for vanilla, which means that it has specific standards for the quality of vanilla extracts. This, in turn, requires specific methodologies, equipment and technologies to deliver the 'real' goods in the business of flavour and aroma. If natural vanilla is to succeed in India, this infrastructure for curing and extraction will have to be built. More importantly, as technologies are tightly held, indigenous development will be needed to perfect the best way to extract the essence. This is the Achilles heel of the business, say many. For instance, Mother Dairy, in its response to Down To Earth regarding its natural vanilla ice cream programme, explained that for the past one year, the samples of natural vanilla it has received from the Spices Board of India have been unsatisfactory. The ice cream major admits that the use of natural vanilla has distinct advantages over synthetic ethyl vanillin. But the samples supplied to it were not acceptable as they were based on alcohol extract, says the company. Then the board developed a flavour based on glycol, which is a regular diluent. But the flavour intensity of this essence was low; consumers did not like it. In July 2007, a fresh batch has been submitted by the spices board, which the ice cream company says is "comparable to artificial vanilla". Now it is working to launch its new product with this essence. But clearly, this is where the other nub of the problem is. In India, the business of extraction is limited to a few companies. The big ones prefer to invest in plants to cure vanilla green beans but then export to extractors in the us and Europe for processing. Vanilco has set up an extraction unit, using technology developed by the Indian Institute of Technology, Mumbai, called the super critical fluid extraction unit. Others are joining in. M/s Sami labs of Bangalore is using the same technology for nutraceutical extraction. 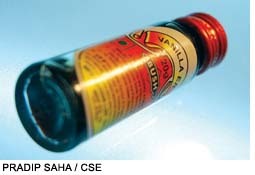 Officials of the company say that M/s Sami Labs is working to standardise the extract assay from Indian vanilla beans. But it is finding that while the international market demands 95 per cent assay, it is getting only 40 per cent in its process. The company's representatives say that the problem is in the quality of the curing of the beans. This is simply not on par with quality requirements, they argue. It is therefore evident that there are quite a few slips between the farmers who grows the bean and the consumer--you and I--who wants to savour the fragrance and aroma of the king's scent.